Islamist gunmen attack a bus carrying pilgrims in a desert area south of the capital. Coptic sources say ten died, but the toll could get higher. For Catholic Church spokesman, the militants acted out of revenge, raising fear of a new wave of attacks. 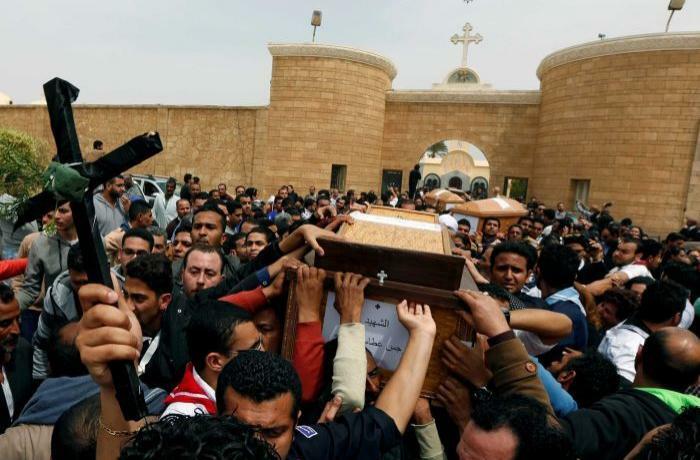 Cairo (AsiaNews) – Egypt’s Copts are once again the target of Islamic militants. Today a bus carrying Christians pilgrims was ambushed on their way to a monastery in a remote desert area south of the capital, Cairo, killing at least seven and wounding 12, the Interior Ministry said. A spokesman for Orthodox Coptic Church, Bouls Halim, said that the death toll was likely to rise. Other unconfirmed Christian sources in Minya, where the incident occurred, said that ten people were killed. No group has yet to claim responsibility for the attack, but the incident has all the hallmarks of the Islamic State (IS) group. IS cells have been operating in the region in question for some times. They have also clashed with Egyptian security forces in the Sinai Peninsula and in the desert along the border with Libya. Speaking to AsiaNews, Fr Rafic Greiche, spokesperson for the Egyptian Catholic Church, expressed "solidarity and condolences to the Copts, our brothers in Christ". The "painful event" did not touch only "Christians, but also many Muslims" who are peaceful and opposed to jihadi violence. According to the Christian cleric, "the attack could be the Jihadis’ response " to the World Youth Forum (WYF) scheduled for 3-6 November in Sharm el Sheikh. "Not being able to hit the WYF because of the imposing security measures, the militants decided to hit a soft and simpler target." A year and a half ago, jihadis "hit the same target with the same means. This is the second time this happens and it is likely that they acted out of revenge". In a country of almost 95 million people with a large Muslim majority, Copts are a substantial minority of around 10 per cent of the total population. Many now fear that this incident might be the beginning of a new wave of violence. In 2016 and 2017, a series of deadly attacks took place, some against Christians. A few weeks ago, a military court sentenced 17 people to death in connection with this violence. The violent escalation almost jeopardised Pope Francis’s apostolic trip to Egypt in April 2017. However, the pontiff was able to visit the country and meet Egyptian President Abel al-Sisi and the Grand Imam of al-Azhar Ahmad al-Tayeb as well as celebrate Mass in front of tens of thousands of faithful.